The thoughts of Paul Evans. A phone call just as I was settling down to watch Cardiff City’s vital game at Burnley today altered my plans for the afternoon as I had to rush off in the car to help with a friend’s domestic emergency. In the event, it didn’t turn out to be as bad as first thought, but it did mean that the match was virtually over by the time I got home. Therefore, this is another of those periodic postings where I will have probably seen less and know less about the game City have just played than most of the people who get to read this. 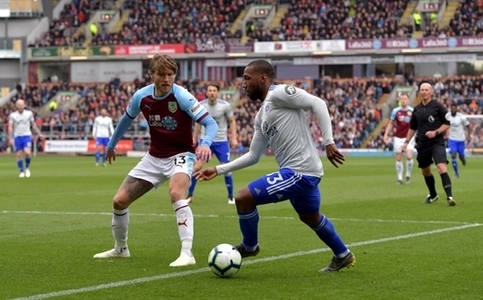 Because of that, I’ll limit myself to just a few general comments about where we find ourselves now after our 2-0 defeat and also the controversial incidents that left the Cardiff contingent feeling they had been hard done by again by the officials. The first thing to say is that we need to beat one of Liverpool or Manchester United to overhaul Burnley now and even in the unlikely event of us doing that, Sean Dyche’s side would need to lose all of their remaining matches. To all intents and purposes, Burnley are safe then and I think you can say the same about Southampton following their 3-1 win over a Wolves side that, yet again, proved to be just the sort of opposition struggling sides need to be facing at this time of the season (for all of the, justified, praise Wolves have had when they play the top teams, they have found things much harder against sides at the bottom than they should have done). Don’t forget that the Saints have that banker of a home match with Huddersfield to fall back on if needs be on the final day of the season. Brighton, who I’ll talk about in more detail shortly, must now be the one team that City can still entertain hopes of overtaking, but they have to go there on Tuesday knowing that, in reality, a draw would leave us having to take something from our two remaining matches against top six sides to stay up if the Seagulls take just the one point from their other five remaining matches – our awful goal difference ensures that. I’ve read on messageboards this evening that our loss today makes no difference to our chances because the situation between Brighton and us has not changed, but I can’t agree with that. Our options have got much more limited after today because we are getting much closer to a scenario whereby we cannot just write the Liverpool and Manchester United games.off and I’m afraid that if and when we get into that territory, there is nothing in our results or performances against the top clubs to suggest we will get even one point off them. It also needs to be said that, at this level, there are no games where we can take victory for granted. I’m sure that any combination of results from the remainder of the Premier League programme picked out by supporters that has City surviving has us winning at already relegated Fulham and beating a Palace team with nothing to play for at Cardiff City Stadium. However, besides the limitations that have been the main reason for many pundits having as down as prime relegation candidates from day one of the season, it has to be pointed out that by beating Everton 2-0 at Craven Cottage this afternoon, Fulham achieved a result that I would say is as impressive as any we have managed thus far. Similarly, Palace’s away record tells us that probably the only way we can beat them is if they are mentally on the beach for what will be their penultimate match of the season. The most likely outcome of all of this has to be relegation for City and I think I’m right in saying that it could come as early as next Sunday if results keep on going against us like they have been in recent weeks. The cold, hard facts say that we are now in a place where a side that has lost six out of its last seven games, has to, at the very least, win three out of its remaining five – it’s not going to happen is it and yet there is still one lifeline for City to cling to. For most of 2019, apart from the likes of Huddersfield, Fulham and, to a lesser degree, us, Bournemouth have been the sort of side any Premier League team would look forward to playing on their own ground – their very good start to the season meant that relegation has never really been an issue for them, but they’d lost eleven of their last twelve away matches before today. Actually, there is another Premier League side that teams could anticipate taking three points off in the days before meeting them with great confidence. Apart from their wins in successive matches over Huddersfield and Palace a few weeks back, Brighton’s league results in the last five months or so have been wretched and that’s why, with matches against Spurs, Arsenal and Manchester City to come, today’s visit from Bournemouth was absolutely huge for them. Beat Bournemouth and they could go into Tuesday’s match with us in a very confident frame of mind, but a loss today would really make for a very tense atmosphere among the home team and fans for what would become a critical midweek game at the Amex. However, it’s one thing to go into that match having been beaten by, say, 2-1 by Bournemouth and another thing completely to have to face us having lost 5-0l on your own patch to a side with no away form to speak of – I find it impossible to believe that Brighton won’t be scared stiff going into Tuesday’s game and I would really fancy our chances if we could score first. A win for us would be a real momentum changer and I reckon that could help greatly in our bid to get those six points off Fulham and Palace. As for Brighton, besides those three games against top six sides I mentioned earlier, a visit to Wolves and a home game with safe now Newcastle would appear to offer them hope, but a loss to us following on from today’s thrashing would leave them absolutely on the floor mentally – I reckon if we could add two more victories to one against Brighton we’d stay up. Mind you, to do that we will certainly need a bit more luck when it comes to the big decisions in games. I still believe that the only reason we didn’t beat Chelsea was the ineptitude of the referee and one of his linesmen. Despite it being generally agreed that Burnley were the better side today, I’ve heard pundits say that we should have had three penalties and there is also talk on messageboards about Ashley Barnes being offside and interfering with play while he was stood in front of Neil Etheridge for the first goal. Having not seen any of the controversial incidents yet, I can only go by what people who have seen them are saying, but the incident whereby referee Mike Dean awarded a penalty for handball against Ben Mee then, seemingly, told a linesman who believed it was handball that it wasn’t and promptly changed his mind sounds downright bizarre. More than any other of the Premier League referees, Mr Dean has always struck me as someone who likes to give a penalty, so it seems odd that having given one today, he had such a dramatic change of mind – maybe it was a sort of revenge for the very soft penalty he gave us which enabled Ross McCormack to rescue a draw for us in added time in the last South Wales derby match to be played at Ninian Park! Interestingly, Sean Morrison seemed to think that our shout for a penalty after Charlie Taylor appeared to bring down Aron Gunnarsson was a stronger one than the one Mr Dean had second thoughts on – I’ll have to wait and see about that for a few hours more yet, but more blunders by officials to match the ones against Chelsea would have me thinking that someone up there wants us relegated. Finally, it should be recorded that Cardiff City beat Burnley 5-3 on aggregate today, because our Under 18s rounded off their regular season programme with a 5-1 win at Treforest this lunchtime. Burnley got the scoring going by taking a tenth minute lead, but Sam Bowen, Connor Davies and Kieron Evans all scored between the thirty third and fortieth minutes to give us a comfortable half time lead. After that, Dan Griffiths added a fourth not long after he was involved in an off the ball incident which saw a Burnley defender receive a red card. The scoring was completed by sub Siyobonga Licenza and so City head into the Play Offs not in great form, but with a degree of confidence restored following a first win in five games. Elsewhere, league leaders Ipswich suffered a second successive 4-0 defeat against a Sheffield side as United beat them on their own pitch, so City find themselves back at the top of the table and will be Champions if Ipswich fail to win at Palace (who are unbeaten in five matches) on Thursday. Once again, can I make a request for support from readers by them becoming my Patrons through Patreon. Full details of this scheme and the reasons why I decided to introduce it can be found here, but I should say that the feedback I have got so far has indicated a reluctance from some to use Patreon as they prefer to opt for a direct payment to me. If you are interested in becoming a patron and would prefer to make a direct contribution, please contact me at paul.evans8153@hotmail.com or in the Feedback section of the blog and I will send you my bank/PayPal details.